Double Digging is for the Birds! I dug potatoes the other day and right now, as I write (11:09pm,) I am boiling up some of the ones that got nicked by the spade. I’m planning a bedtime snack of mashed potatoes to calm my heartburn from the homemade pizza sauce I had for supper! Although most of the summer we’ve had a shortage of rain bordering on drought, a recent welcomed shower plus the fact that we did double digging in the spring made digging the potatoes pretty easy. You’ll also see straw at the back of this photo which we used to cover seed potatoes that we planted very shallowly. The straw was wonderful for keeping the weeds down and the moisture in, but I’m not sure it did a lot for the size of the harvest. Double digging is part of the method for John Jeavons’ Grow More Vegetables that inspired our garden. In the lower right of the photo you see one of the digging boards that Steven made for us. 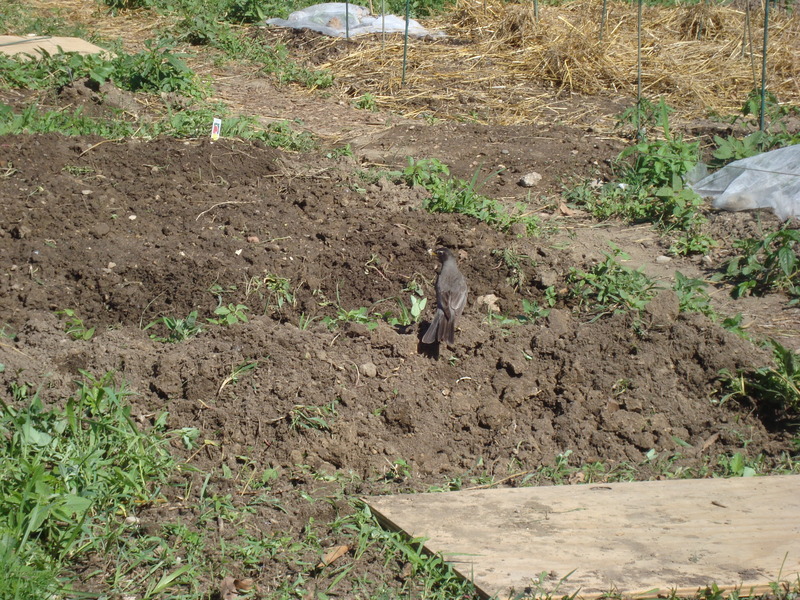 As you double dig, you stand on the board to spread your weight and keep from compacting the soil. It was a lot of work, and when everyone else is planting and you are “still digging”, you can be tempted to give up, but the pay off later in the gardening season is worth it. For several days in April as we loosened the soil to a depth of about 12 inches, a robin kept us company, enjoying the worms and grubs we exposed. So I guess double digging is not just for the garden, it’s for the birds too! You have been working hard!